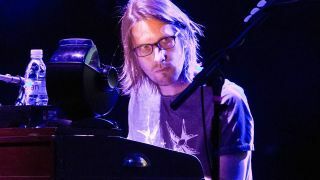 Steven Wilson says he won’t repeat himself on follow-up to Hand. Cannot. Erase. Stephen Wilson has confirmed that he’s begun writing his first full-length album project since 2015’s Hand. Cannot. Erase. He says it’s still early days but insists he won’t retread old ground as he sees no point in repeating his previous successes. Wilson tells Mitch Lafon: “I’m just beginning to think about where I might go. The one thing I really am always very committed to is to not repeat myself and that every major album project should have its own reason to exist. “I’m not interested in making another Hand. Cannot. Erase. or another Insurgentes because what’s the point? Wilson launched “interim” album 4½ in January, a six-track release designed to bridge the gap between Hand. Cannot. Erase. and his next full-length release. He’s currently on the road in North America and has dates lined up in South America and Europe in the coming months.